-The size of the dog. -The walking pace of the dog. -The dogs distraction levels in regards to scent distraction, bird/dog/cat distraction, livestock distraction. -The dogs sensitivities: does the dog like physical contact, does the dog get very excited or stressed by loud noises, how mentally strong is the dog. 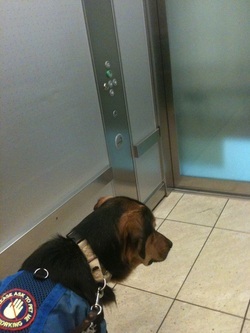 -Is the dog more suited to country, suburban or urban living. - What are his/her particular sensitivities? - If the child has hearing sensitivity I will not match them with a vocal dog. - If the child has touch sensitivity, for example if he or she likes the feel of the coat and the thud of the wagging tail but does not like the feel of the wetness of the tongue then I will match them with a dog who likes physical contact but who is not a particularly licky dog. - If the child has body sensitivity and does not like physical contact I will match them with a dog who does not seek too much physical contact. - If the child loves physical contact I will make sure I do not match them with a dog with body sensitivity or a dog who gets too excited by body contact. - If the child is a toe walker (walks on his/her toes rather than on the flat of the foot to reduce the feedback that he/she gets from the surface of the ground) then there is a higher chance that the child will stumble a lot more so I will match them with a dog that will not mind the child leaning a little bit on the dogs back for balance. - Will the primary handler be male or female? - What pace do they walk? - How physically strong are they? - How physically fit are they? - Do they use different tones in their voice? - Does the handler like dogs? - Does the handler have any fear of dogs? - Who will the second handler be? - How many in the family? - Are any of the family afraid of dogs? - Any other disabilities in the house? - Any pets in the house? - Any other relevant adult in the home, eg au pair, relations etc? - If both parents work, who will look after the dog during the day? - Do the family live in the country/suburbs/town/city. - Do they live in a house, apartment etc . - Is the spending (toileting area) grass or concrete. - Do they use public transport. - If they commute for school/work, how long is the commute. - If they live in the country, is there livestock around the home. 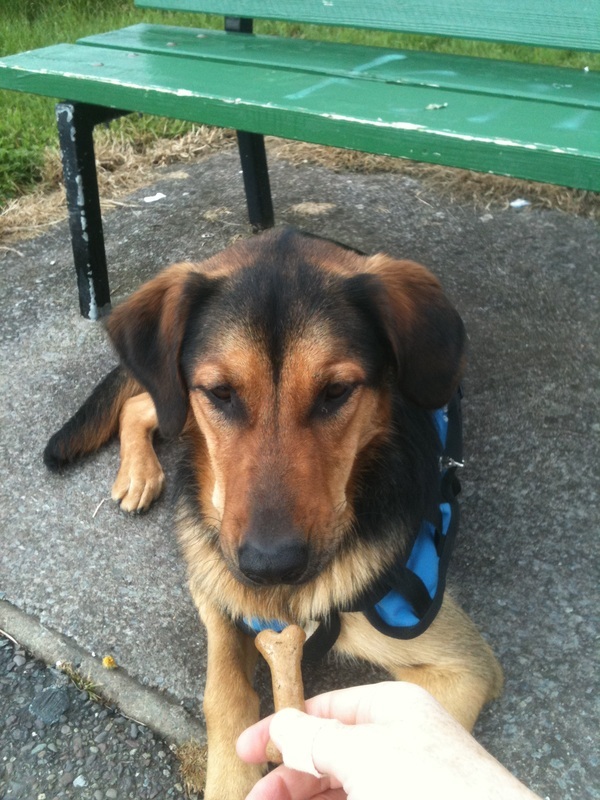 - Are there safe routes to work a dog from home or will every walk have to be from the car. - Do they travel abroad a lot. These are just some of the things I take into consideration when matching my dogs. We have a waiting list at present. When matching I start at the top of the waiting list in order to give priority to those who are waiting the longest. However, if the dog that I have does not suit the family I will move onto the next family on the list. It is a tough thing to do, knowing that that family have to wait longer for a dog, but if the match is not right then choosing them will be futile. An incorrect match will only make life more difficult for a family in the long run which is not what we aim to achieve. Susan (who you will remember from writing this blog before me) and her daughter Chloe along with her son Philip. While considering all of the matches I am still working Hector and my other dogs in a variety of areas. Practicing routes and getting them used to challenging environments. I do as many attachments as I can with children both with Autism and without. When doing attachments we try to keep the child on the inside away from the traffic. The handler will change position depending on the environment. 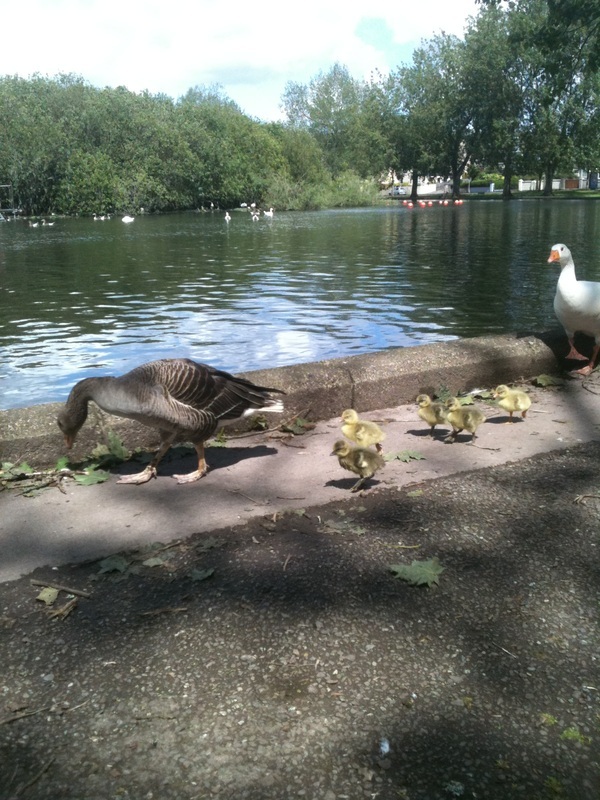 If the area is nice and safe such as a park, then the handler may drop back behind the child and dog. If the area is more dangerous such as near a main road, the handler will be right up by the dogs shoulder in line with the dog and child. We had a surprise visit from Sonya O'Sullivan this week. She dropped in with her daughter to see how Hector was getting on with his training. She was very impressed at how mature he looked. At this stage I have now started attachments. I ask one of my colleagues to play the role of a child. Tara kindly agreed to be my child in the photo below and she is attached to Hector using a belt around her waist and an attachment lead attached to Hector’s jacket. We start nice and gently asking Hector to do his work with two people on either side of him. Gradually I ask Tara to overstep the kerb or drop the handle and run and as she does so I give Hector instructions. Tara will also do typical child behaviours such as skipping, tapping, picking up sticks and waving them. Gradually I will ask her to do more intense behaviours such as turning and shouting. I will see how Hector copes with these. After a few weeks I will attach a child to Hector. I use my young niece and nephew for this along with some of my colleague’s relations. The children will do more natural child behaviours and can be more unpredictable. The dogs also will have no respect for the child so I need to be sure that they behave themselves and will not try to take advantage. After another few sessions I will attach Hector to a child with Autism to get the most realistic experience. home for a couple of nights to see how he settled in and to see if he had developed any bad habits like chewing, crying, barking or landscaping. It was also a good way to see how he behaved while travelling in the car. He was very well behaved and we had a few fun play sessions. He is still fond of chasing his tail! I have also started looking at the matching process where by I match Hector to a suitable family. I will update you on this process soon. I started pushing Hector a little more this week to test his work. Examples of this are when I overstep the kerb to see if he will stop. I also work in a number of different environments to test for different reactions and consistency in this work. Country – to see how he copes with country walks, livestock, lack of footpaths. Urban - to get him used to busy environments, traffic, public transport, increased noise levels. Things that can upset a dog in training vary but they include statues, balloons, shadows, masks, strange noises, steps or platforms with a glass drop off or where you can see through the stairs. Many of our families have young children. I work with buggies and shopping trolleys so that the dogs can learn to work close to these without becoming over aware or scared. And to learn how to avoid getting clipped by the wheels. Outdoor obedience can be a bit more challenging than indoor obedience as the surroundings are often much more exciting. Areas like the river walk are good to see how he copes with cyclists, runners, roller bladders and children of all ages. 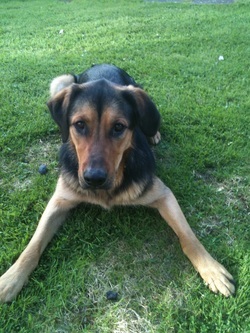 At this stage in Hector’s training I do not use food rewards as he does not need them, with the exception on free run. I use it intermittently on free run to reward a good recall response. However it is important to know that he will refuse food until given permission to take it and that when he does take it, he does so very gently. I will be working on other food refusal work to see if he tries to take any food from food stalls or off the ground. The dogs are just at buggy level so I have to watch that he does not try to take a lick of a child’s dripping ice cream as they go by or swipe a biscuit from their hand. Dogs are opportunists so they will chance it if they think they will get away with it. children’s rides. These can be a little bit scary for dogs especially if they go off intermittently when we are walking by. The dogs have to be very well behaved indoors and need to learn how to behave when approached by the public. I have a sign on the dog’s jacket stating, please ask to pet me. the dog needs to be well behaved. Some of the children with Autism particularly those with hearing sensitivity will not want to stop and talk about the dog (or allow their parent to talk about the dog) so it is important to know how to get the dog to ignore public attention. Other areas I work on in the shopping centre are: trolley work, lifts, stairs, food refusal, fitting into a changing cubicle or toilet and hand dryers. 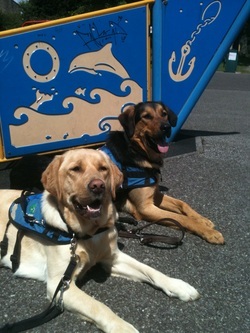 Keela and Hector in the playground. I do a lot of work in Café’s and restaurants to be sure that Hector is well behaved. There should be absolutely no begging from the table, no attention seeking and no hovering of the floor or licking the table legs clean. He should lie down quietly until such time as he is asked to get up. I do a lot of work getting the dogs used to people stepping over them so that they do not pop up every time somebody moves. They also need to be good around toddlers who will often unintentionally prod or poke them or pull their hair/tail. Playgrounds. I do a lot of work in playgrounds getting the dogs used to being obedient in highly intense areas. There can be a lot of high pitch laughing, crying, screeching which can be exciting for the dogs. I teach the dogs how to behave when approached by children and I use benching as a tool to help manage the dog and the child at the same time. This is a form of tethering where the dog is tied to a secure area such as a park railing or bench. I control the dog then using my voice and body language. This can be used in other areas such as by the Lough when feeding the birds. The Lough is particularly good area to train for bird and dog distraction. The birds are very protective of their young and can get quite nasty if you go too close so the dogs have to know how to cope with this and will do so by getting security from the handler. 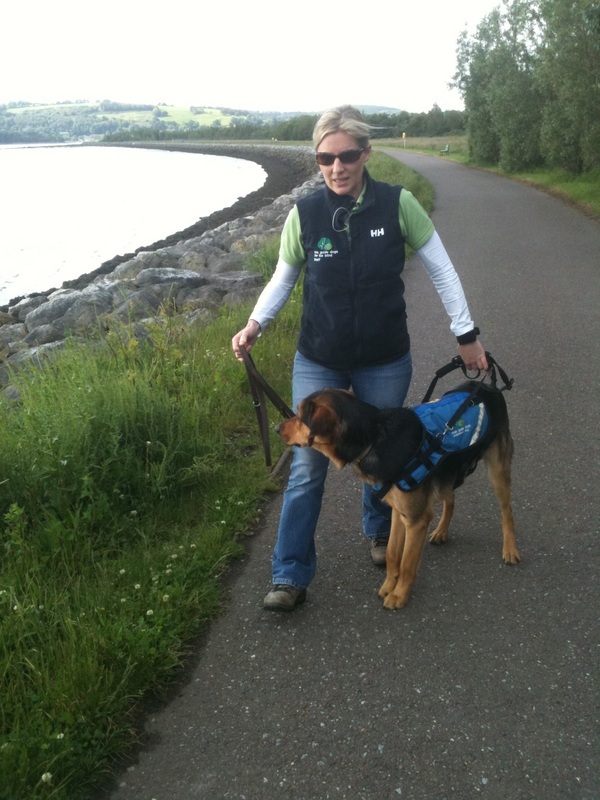 My name is Aileen Foy, I'm an Assistance Dog instructor with IGDB. I've taken over Hector’s training now he is in Advanced Training. He will be with me for 11 weeks during which time I will match him to a family with a child with Autism. I've spent a lot of time with Hector getting to know him and to allow him time to develop a bond with me and to learn to trust me. I did some nice easy walks in different environments so that I could see how he coped with a change of handler. 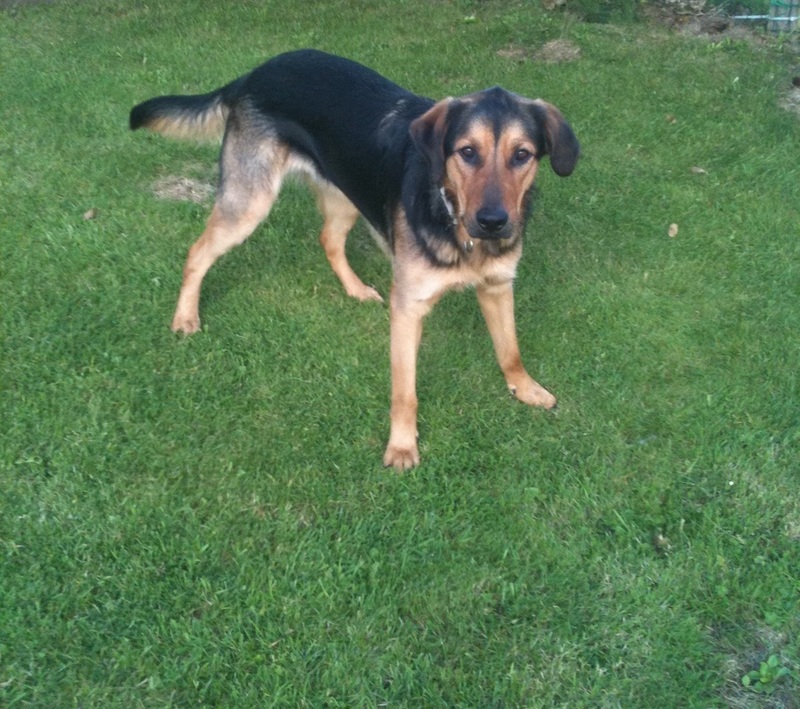 He is a very sweet dog with a sensitive nature, he's still young and a little immature at this stage. He can be a little bit vocal in the morning wanting to be picked first to be brought to the van. Laika, Hector, Lily, Keela & Creen. Kennel Assistant who looks after him the most and she keeps him healthy and well groomed. 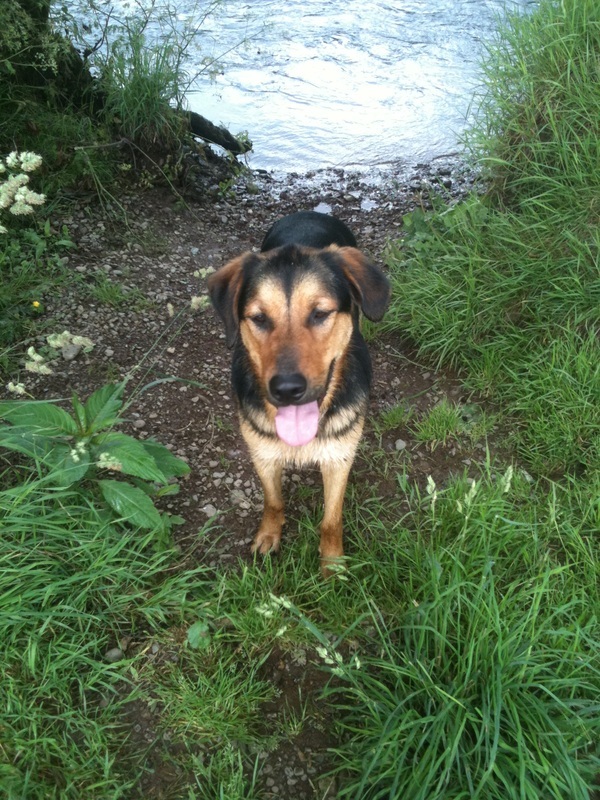 After a few weeks I have developed a bond with Hector, I also took him on his first free run which was fun. He loves the water and his recall is pretty good. He has quite a typical German Shepherd behaviour, as he can be a bit over the top on free run trying to jump onto the other dogs running with him. This is not an aggressive behaviour just a bit of over enthusiastic play and can be a little bit annoying for the other dogs. I am using a gentle leader on Hector as he can sometimes have high tension. The gentle leader is similar to a halti, it is often mistaken for a muzzle, however, it is very different, it works like a head collar on a horse in that it steers the head rather than the neck. Hector has full movement of his mouth and can eat or drink with this on. It is very beneficial for strong dogs or not so strong handlers. It is a very handy tool when introduced correctly. Time to take the train. training with some of my dogs in the past. If a dog is not a good traveler or does not like public transport then I will not match the dog to a client who uses public transport daily or who has long commutes. I use areas like Blackrock castle for a number of reasons, for example it is a typical place that families bring children so it is a realistic training area. I work on dog distraction, scent distraction and bird distraction in particular. This is a very high incentive area for a dog and it can be challenging for them to ignore their natural chase instinct. We meet a lot of dogs on the lead, off the lead and with flexi leads so they have a lot to contend with. 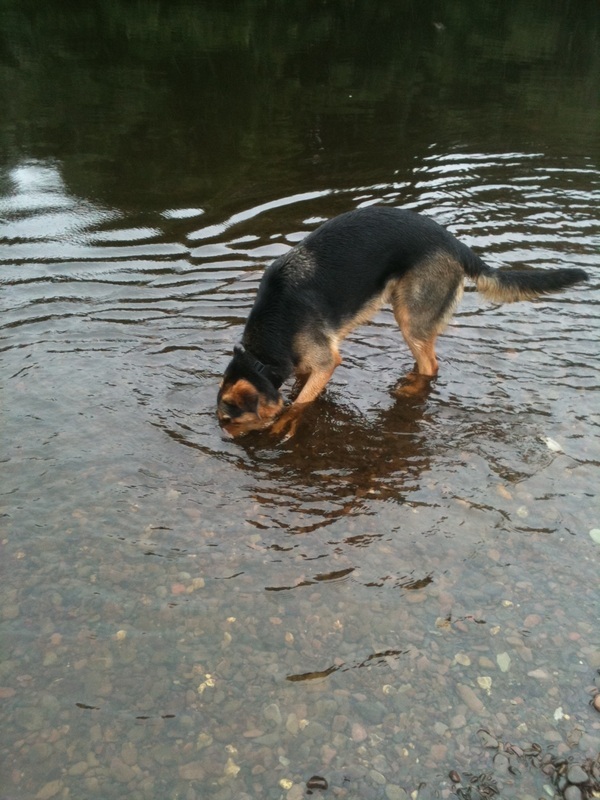 Hector loves the water so it takes a bit of extra effort to get him to ignore the water and walk nicely. I'll have more updates on our progress in the next blog. Hector loves the water, but he is learning to ignore it. continuing to develop his training up to Assistance dog pick up standards such as making sure Hector is relaxed, confident and responsive in all areas of his work. and he was well behaved and responsive to his handler. He has made lovely progress and is continuing to mature to be a nice dog. Hector and Lyra on the train. We also went on a train and bus journey, we do this to make sure that he is happy to get on/off train/bus and that he is relaxed on the journey. This is all part of preparing Hector to make he meets the high standards needed for advance training and when he eventually qualifies as a working assistance dog. Hector has met all these high standards and has moved onto Advanced Training. demonstrating appropriate response to directional commands. It's always hard when a dog moves on to its new trainer and I will miss Hector alot, but I'm very happy and proud that he has moved on the next step of his working life! So what does this next step mean for Hector? 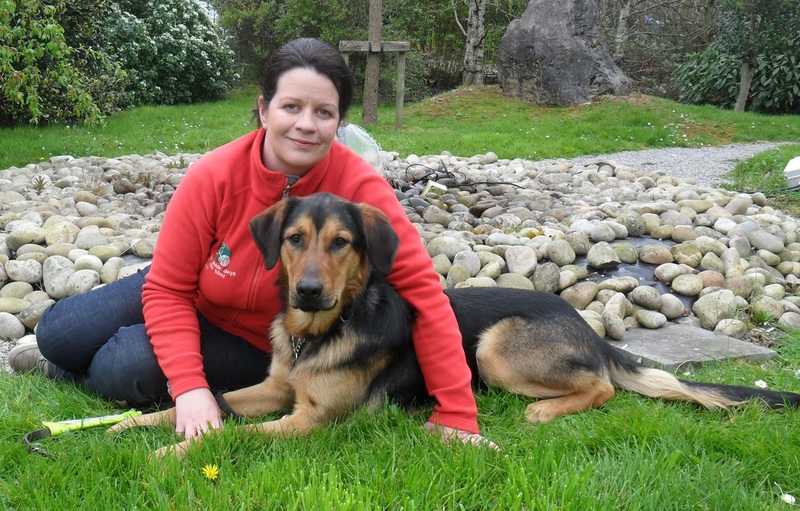 Hector's training will still take place in our training centre here, but he will now train with Assistant Dog Instructor Aileen and she will work with him with the aim of matching to his new family in the coming months. I have really enjoyed my time training Hector, seeing him mature and continue to be a lovely dog. His new Instructor Aileen will keep you updated on his training. PROGRAMME based on Hector qualities. So why did we make this decision? good with children. This makes him an ideal candidate for the Assistance Dog Programme. I am delighted that Hector is moving up in the world and I am sure that he will do very well with his new Assitance Dog Instructor. I have been working with Hector on developing his training tasks such as stopping at any kerbs that we come across, walking in a straight line, his commands 'left' for turning left and 'right' for turning right. This is initially taught, where possible, at kerbs as we want to encourage straight crossings, so that we spend the minimum time in the road. As his training develops, his concentration improves for the training tasks that he is learning, and so his distraction levels come down and the less support the handler gives him. Before he goes on to advanced training, I want him to be able to do all the tasks with as little input from the handler. This makes him an easy dog for someone with less experience to handle. I have also been working on Hector's social behaviour in coffee shops / resturants, as it is important that the dog lies down beside the handler or under the table and does not look for food. 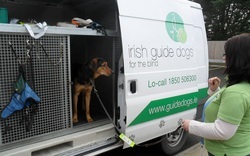 We launched SHADES, our annual fundraising campaign earlier this month and Hector travelled to Dublin to attend. 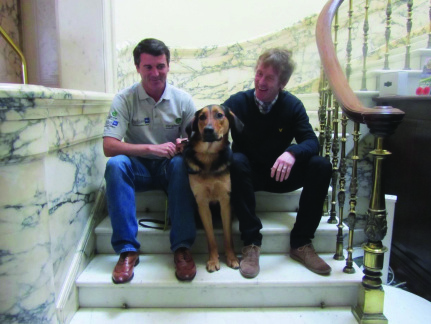 Our 10th annual SHADES fundraising campaign got off to a great start with the help of long standing supporter Roy Keane, and we got a shot of Hector & Roy at the launch. all the team. We met with Hector Ó hEochagáin and he was delighted to see him and he coudnt believe how much he had grown and also how calm and mature he had become. Surprise visitors for Hector this week! The last two weeks have been great for both Hector and I. It's been busy and productive but we also enjoyed a few lovely surprises. Hector's Puppy Walker Michele Munnelly and her two daughters paid us a visit here at HQ, as did long standing supporter Sonia O'Sullivan. My goodness - the excitement! Hector was so delighted to see his foster family, he didn't know who to go to first - Michele, her daughters, or me! Hector got lots of cuddles from the all the girls and even remembered a few tricks that Michele had taught him. As showed in the photographs below, Hector demonstrated his obedience skills by ignoring the treat that Michele had placed on his paw. He waited patiently until she gave the command and then proceeded to 'munch away' as everyone cheered in delight. Hector also got to meet Sonia O'Sullivan again when she came to our HQ for a photoshoot for the upcoming Carrigaline to Crosshaven Charity Walk on May 27th. Sonia had met Hector as a pup and couldn't get over how he had matured and grown. Hector was the designated 'dog model' on the photoshoot and did a sterling job. Hector also joined another special photoshoot with some of our other dogs in training. On Thursday last week, we launched our 2012 Car Draw at a Ford dealership on Forge Hill in Cork. Hector got to pose with the brand new candy-red Ford Focus up for grabs in the draw and once again did us proud! Tickets for the draw are on sale country wide or on our website for €5 a ticket. At the start of training, I spent time getting to know him, practiced his obedience and developed a bond of trust. During this stage, I assessed his speed of walking; his distractions levels; his mental, hearing and body sensitivities. Once settled, I had better understanding of his unique qualities and we were both ready to start straight line work. This is teaching him to walk in a straight line until I dictate which direction to go. I taught him his left and right turns, stopping and standing at all kerbs, including edged, flat or tactile types and road crossings. A key part of crossing the road is to teach a dog to firstly find the zebra crossing. The dog then needs to cross over in a straight line in minimum time. Once safely across, the dog needs to wait for the handler’s command (i.e. left, right or straight on) and continue on. Right Shoulder work is teaching the dog to avoid obstacles and to consider the handler as it does so. Obstacles can be stationary objects like a lamp post, wheelie bin or parked car to moving obstacles such as people, child buggies or bicycles. We also teach them how to handle a narrowing path, for example, a restricted space due to car being parked on a pavement. They are taught that if they can't fit through safely with their handler, they need to leave the path and go around the car and return safely to the pavement. Much time is also spent on similar commands applied indoors. Indoor work includes things like finding doors, walking stairs, using escalators and elevators and avoiding obstacles like tables and chairs. During all this training, the dog learns to concentrate on the handler and follow their commands. Hector has progressed very well, moving from quieter environments in the suburbs right to the busy city centre. I'm really pleased! In the next few weeks, Hector will be “working his charm” for our SHADES annual fundraising week taking place May 7th-13th. 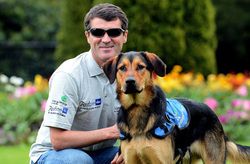 He’ll once again meet with our campaign patron, Roy Keane and be out and about supporting our collections. SHADES 2012 - Volunteers needed for MAY 12TH! We’re urgently looking for volunteers to sell SHADES pins for a few hours at Tesco Stores nationwide on May 12th. Can you help out? 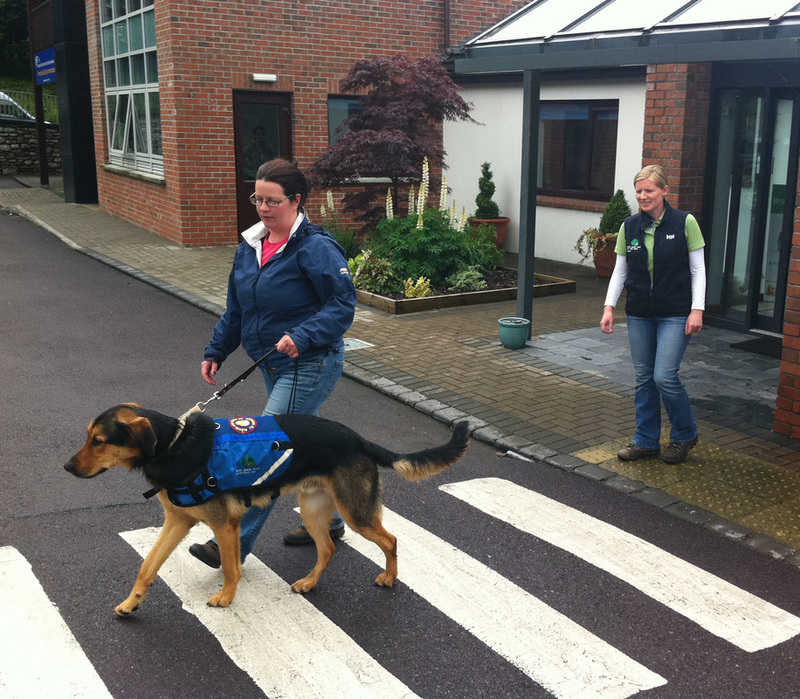 Please let us know on e-mail fundraising@guidedogs.ie or call 1850 506 300 if you can volunteer! Hector's making great progress on Early Training! 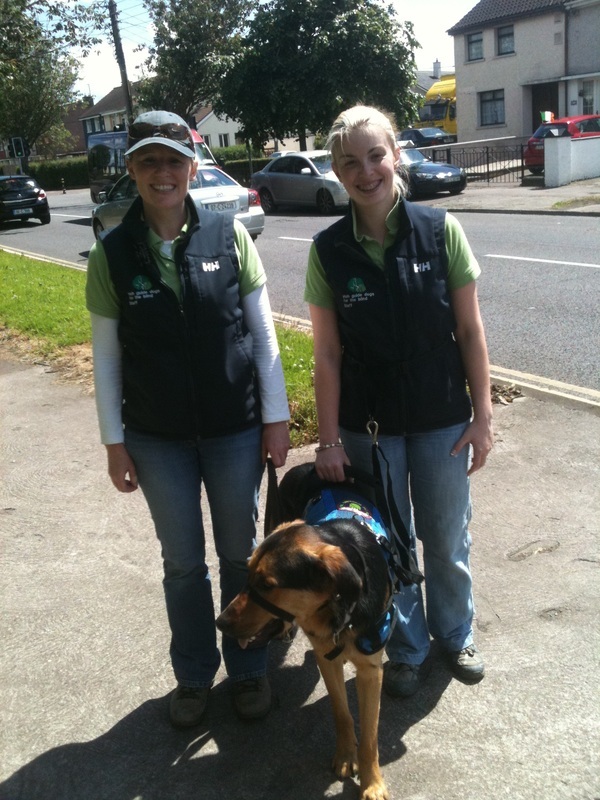 Hi, I'm Susan Turtle and I'm puppy Hector's Trainer here that the Irish Guide Dogs for the Blind. You could hardly call Hector a puppy anymore - he's already 15 months old and well into his Early Training at our National Headquarters and Training Centre in Cork. I'll be keeping you posted on Hector's progress during the next stage of his training. Special thanks to Michele Munnelly, Hector's Volunteer Puppy Walker, who not only did a sterling job of socialising and training Hector, but also maintained our blog for the first 12 months of his life. Now that he's well and settled into his routine, we're ready to give you regular updates on his progress towards becoming a guide or assistance dog! A new year, a new home! 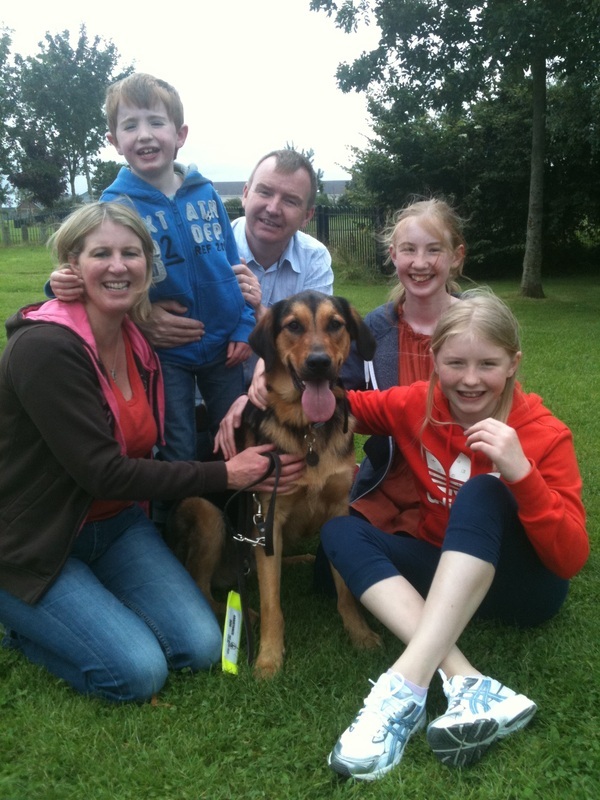 Around mid January, Hector left his home with the Munnelly's in Dublin and returned to our HQ in Cork. It's always great to welcome our pups back after their 12 months away with their Volunteer Puppy Walkers. So much has changed as they have grown tremendously during this important stage of their development. Having to say goodbye is tough for our volunteers, but each year, they bravely tackle the task of returning them to us motivated by the fact that their fostered pup will one day become someone's life changing partner. Charlotte giving Hector his first groom! Kennel. After some play time and dinner, Hector cuddled in for his first night and got some well deserved rest. initially as we started to get to know each other. I introduced him to the other dogs in my group and got him settled with his Kennel buddy Tilly. We worked on commands such as sits and downs which was met with treats and lots of praise. He was eager to please and I wanted to ensure that he settled in well. "Watch me, I can do it! Piece of cake!" The next step was to introduce him to the van that he would be travelling in on a daily basis. Hector mastered getting in and out of the van with no problem and soon after, we were ready to go on our first walk together. We headed for a quiet estate nearby and so officially began our daily routine of training. Before & after a free run in the woods! There's nothing quite like a swim in the river before heading back to HQ! Back, left to right: Joey, McGuire, Jake and Hector's sister, Orry. Alongside is Hector, Lulu and Nikita in the background. Hector's got a lovely temperament. He is very willing and responsive to my commands. He's still young and so can get distracted at times. He's very curious so people and activity can sometimes draw his attention away. I'm not too concerned as he's still maturing and this will become less of an issue as he progresses through his training. He especially loves attention and so many people stop us when we're out to talk about how handsome he is (which he of course loves). He enjoys cuddles and praise and shows his delight with a vigarous bout of tail wagging. In the beginning, other dogs were a big distraction, which is understandable considering that he's surrounded by so many here at HQ. A firm tone of voice with the command to go "straight on" gets him back on track. We have developed a good bond and he shows his respect for me as his trainer by trying very hard to listen. In my next blog, I'll tell you a bit more about what Hector's been learning and includes some photographs of him in action while training!